The vivid color in this scene is perfect for Topaz Impression. Very realistic appearing paint strokes, particularly in the vegetation, and the color palette is amazing. 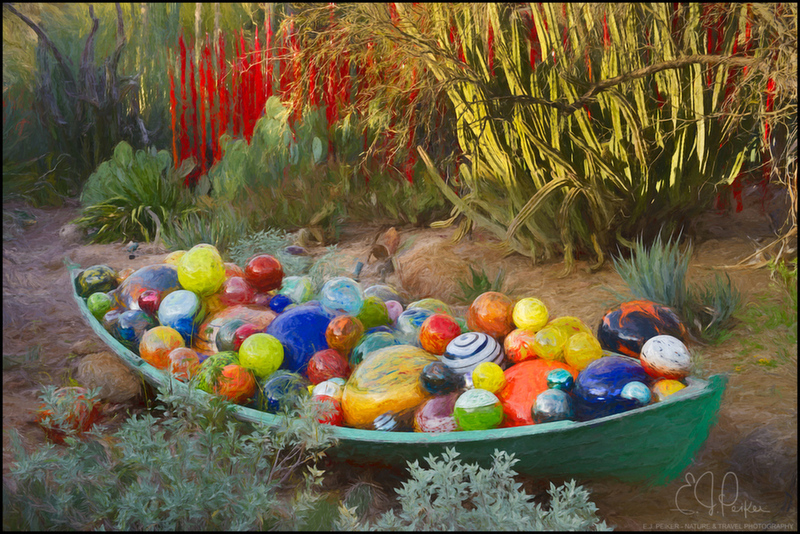 The boat full of colorful spheres is awesome – and has a lovely painterly appearance, particularly when viewed large. The red vegetation in the background ties in perfectly color wise, and is beautifully illuminated – just a great finishing touch. Very lovely, artistic work, EJ. I love these beautiful and artistic glass sculptures, he is a great talent! The colours are so vibrant and so cleverly arranged to complement each other in their various settings. Here, the red glass spikes among the foliage take my eye back from the glorious spheres in the foreground boat, and then they just have to come back to their amazing rainbow colours clustered together. You got the perfect light and your gentle treatment is perfect for this feast for the eyes. Beautifully done! What a wonderful piece of whimsy, in the best sense of the word- so colorful and imaginative- you did beautifully with just the right artistic touch to enhance this entertaining and attractive exhibit. Looking forward to more!